Pancakes and Paella: Mmmmmm Ribs! Ribs are awesome. Just awesome. Don't let anyone fool you into thinking ribs are just a summertime or fall food, that is a lie! Ribs are for anytime you want them. If you do need an excuse to make them, the Super Bowl is tomorrow, so get cooking! Also, this recipe I'm sharing uses exclusively the oven and stovetop, so no grill needed (in case it's frigid where you are or your grill is covered in snow). I've actually only ever used one recipe - it's perfection so I haven't tried another. It's Alton Brown's Baby Back Rib recipe. I've copied it below. If you go to the link, you can watch a video of him with some tips. But don't feel overwhelmed, these are actually pretty easy to make. Your family and friends will thank you (if you decide to share them). A not-so-rare conversation when anyone mentions ribs, is for them to tell you who makes the best ribs. Dry rub vs saucy, memphis style vs some other style, spare ribs vs baby back, the choices are endless. I was raised being told that Dreamland BBQ ribs in Tuscaloosa have the best ribs. My dad would bring them home after going there for work, we'd get them when going to football games, and they were awesome. I have to say "were" because when I went to college at UA, I discovered Archibald's in Northport on Watermelon Rd. Talk about amazing ribs! Sorry Dreamland, ever since then Archibald's (and Archibald's and Woodrow's in Tuscaloosa) are my favorite. Tuscaloosa location is super convenient too to stop and grab a slab or two on my way back home to Prattville! That said, I must say that this rib recipe give all the others I've ever had a run for their money. A lot has to do with the quality of the meat you buy, so get good meat. Ok, now for the main event. Ribs. First, buy some baby back ribs. This recipe is based on two slabs. Put them on tin foil, shiny side down (so meat is on the non-shiny side). Be generous with your foil, and use thick foil, not the cheap stuff, you'll thank me. It's no fun for a bone to poke through and you spill braising liquid all over the place. I speak from experience. You'll want a nice loose "tent" around the sides and tops of the slabs. Mix up your dry rub, and pat it all over both sides of each slab. VERY loosely wrap up the ribs, trying to make a tent on the top. Roll up one end, leave the other end open like a funnel. You'll see why in a minute. Make the liquid, pour it in a measuring cup (with a pour spout), and pour half of the liquid into each rib tent. The solids will want to hang out at the bottom, so you may have to divide those up once you get to the end of your pouring. Put each slab on a pan, they can hang off but make sure your ends are turned up so any liquid will stay in the bottom of the foil "tent". Both pans need to fit in your oven at once. Braise the ribs for at least 2-1/2 hours. 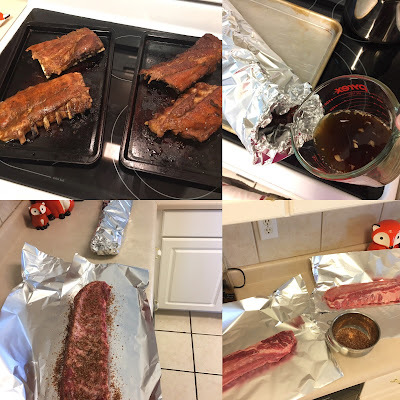 Now for the tricky part, when the ribs are done, you will need to transfer the liquid from the slab foil packets back to a pot so you can reduce the liquid to a sauce. This is where you will be glad you used a lot of nice thick high quality foil. After you reduce your sauce, brush the ribs with the sauce, then put the ribs back in the oven without the foil to broil. I divided mine up into half slabs for broiling since the whole slab hung over the pan. If you are a saucy rib kind of person, you can brush the ribs with more of the sauce after they have broiled. You can dip them in the sauce as you eat them. Or both. This recipe makes several batches of dry rub. If more rub is needed, it can be extended by any amount, as long as the ratio of 8:3:1:1 remains the same.